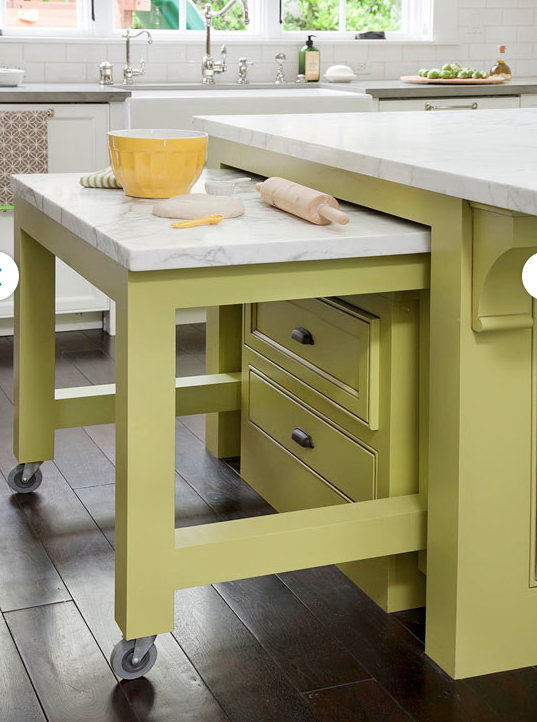 I generally don't like blogging about custom furniture that you have to install yourself (not realistic when you are renting) but I just thought this was such a cute rolling cart space saver, that it would be a good piece of furniture to tuck away when I actually CAN do my own remodeling. Plus it looks so sturdy and I love that the top is matching marble. HOWEVER, no one ever said adorable-hideaway-rolling-kitchen-carts start domestic arguments, just make sure you inform your partner before committing to purchasing a used kitchen cart that you have to go pick up from a stranger from Craigslist on New Year's Eve, pay them cash and carry it home by yourselves. * This paint color advice comes from hearsay and so if you want to paint your kitchen cheery bright yellow, go right ahead.